Lieutenant General Anderson, a former member of Task Force 38 leadership, has retired from operational duty. Stationed on Helios Station, he is now the Starfleet Marine member of the nine person Delta Advisory Council. Jagged was born on Earth to a human father and ½ betazoid mother. He grew up trying to to succeed as his father did. His father was a Colonel in the Marine Corps by the name of Jatin Anderson. His mother was a former Dr who had left her job to become a housewife and mother. Her name was Eleanor Anderson. When Jagged was 14 his father died in combat and his mother tried to carry on as best as she could raising a strong minded and willful son. After a year of this his mother passed away from a very rare disease. His parents had a very close Vulcan friend that was an ambassador and had a large mansion on Vulcan. She had always been considered family so he was shipped off to her Mansion. It took 6 months for him to really get around his mother’s death. He decided to put all of his energy into training to become a Marine. T’Pala helped him learn to control his emotions more so that he could keep his limited abilities with empathy under control. He learned that meditation was able to help him cope with the stresses of his changing abilities. At the age of 19 he left the Vulcan homeworld in a Starfleet ship bound for Earth. He had an appointment to the Academy to train as a Marine. He knew that with him being at Annapolis where they trained some of the best military strategic minds he would have the leg up to get into the Marines. He stayed there for 4 years as a Cadet learning the finer points of the Marines and Tactics. He got top grades in tactics as well as combat both hand to hand as well as distance weapons. He also earned enough in those first 2 years to get into the Officer School. After he graduated from the Academy he was assigned as a Marine Ground Unit in what was Task Force 86 under the watchful eye of Major Kimmerman. He spent 2 years in that position moving up in rank from 2nd Lt to 1st Lt. He was assigned ground based duty for those 2 years. He moved to the USS Pathak to take on the Marine Squadron Lead as a pilot. He spent 3 years serving as the Marine Squadron Lead and got promoted to Captain. He was also during that time promoted to Marine XO. Next was the USS Aichon where he took on the Marine CO position. He stayed there for 3 years. Just as he was leaving to go to Hawkeye Island he was promoted to Major. Hawkeye Island : For 6 years he worked on Hawkeye Island until his foster mother T’Palla passed away leaving him the estate that she had owned for years. He took a leave of absence to return to Vulcan. He decided to go into the reserves of the Marine Corps so that he could stay on Vulcan to take on a role as a Minor Diplomat. He spent 5 years in the Reserves while on Vulcan and then was called back to Active Duty when Task Force 38 needed a XO for the Marine Expeditionary Brigade. He was promoted to the rank of Lt Colonel. He spent a year in that role assigned to Starbase 900. Then was given the USS Poseidon that was attached to Starbase 900. When the Marine Expeditionary Brigade CO Retired he was promoted to Colonel and given command of the MEB. He was still attached to Starbase 900 but was mostly on the USS Poseidon. He quickly gained notoriety for his no nonsense way of dealing with threats and his tactical ability. At that time his long time friend and former CO Diego Macedo decided to retire as the Task Force CO. Diego pushed things through to allow for a leapfrog of Brigadier General to Major General. 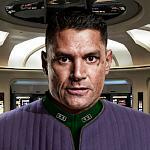 Within a month after his taking over as Major General he was promoted to Lt General and placed as the sole authority in the Delta Quadrant where Security matters lay. His sole mandate was to make the Delta Quadrant safe and stable for the Federation members that were stuck there. During the Borg attack Jagged Anderson who was Colonel and in charge of the USS Poseidon he was tasked by Rear Admiral Macedo with protecting the USS Asclepius. The Asclepius unwittingly came into the zone where the Borg were attacking thinking to help save the Star Base. What they didn’t know was how dangerous the battle was and that the ship just wasn’t able to handle combat. Jagged was sent to the rescue and managed to destroy the one Borg ship that was around them. Jagged also had little love of the Borg and after protecting the Asclepius went haring off after his friend and commanding Officer Macedo. They ended up in the Hyperion System and he was helping found the Helios Colony and Station. It was a hard time and he came into physical combat against multiple people who were trying to get rid of Macedo off of the surface of the planet. Task Force Commanding Officer for Task Force 38 (Former). Jagged has been married twice and has 3 children. He also has one child that is in the delta quadrant. The lady that he had the child with died on Starbase 900. The child who is now 9 is hidden near Helios Colony. His name is Shane. He was named after the friend Shane McColm whom had served under Jagged.